The Edinburgh Military Tattoo takes place in the city each August at the Castle Esplanade. The Tattoo is a ceremonial performance of military music by bands. 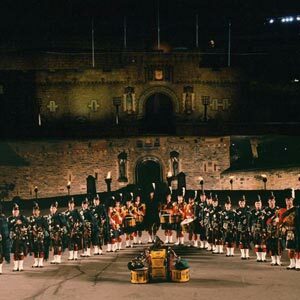 Since 1950, the Edinburgh Military Tattoo has been an annual event held during the International Festival on the Castle Esplanade. It sees nearly 200,000 people each year from all parts of the world. All the performers from over 30 countries, including marchers, dancers and bandsmen stand column after column on the Castle Esplanade. The Tattoo audience joins in a great chorus of singing, cheering, and applause. The spectacular show ends with the Evening Hymn, the sounding of the Last Post and the lowering of the flags on the Castle. The Tattoo offers a colorful kaleidoscope of music. The audience is held spellbound with racing motorcycles and breathtaking re-enactment of battles. Exotic Turkish music and Chinese dancers, Scottish Highland dancers wheeling and swirling to a fiddle orchestra - you can find it all at the Edinburgh Tattoo. The Military Tattoo programme format is based on its four pillars. The first pillar is the mainstay where massed pipes and drums stand in one column after the other. The second is the massed military bands inclusive of brass and woodwind. The third is the cultural pillar comprising dancing and military display programmes from the hometown and elsewhere. The last and the final is the music that is played to present the whole cast on the Edinburgh Castle Esplanade. This is emotional and patriotic culmination of the event. The Edinburgh tattoo tickets for this year were sold well in advance. The theme for this special Tattoo was the Queen's Golden Jubilee. Internet auction sites saw Edinburgh tattoo tickets of values ranging from ?9.50 and ?32.50 selling for a whopping ?200 a pair. Bookings for the tattoo tickets came from all parts of the world. The 55th Edinburgh Military Tattoo was the most successful with 211,027 tattoo tickets selling out in record time.